Designed as the perfect match, this elegant bridal set is made to make your romantic journey unforgettable. Crafted in contemporary 9ct white gold with milgrain detailing, the wedding band is channel set with sparkling diamonds, complemented by an engagement ring featuring a round cut diamond in a halo setting totalling 1/2ct. 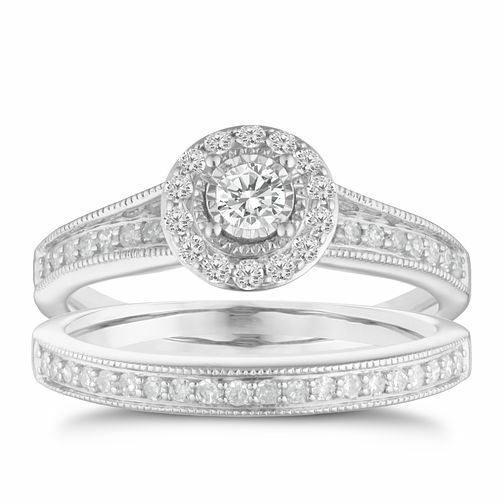 9ct white gold 1/2ct round diamond halo bridal set is rated 5.0 out of 5 by 3. Rated 5 out of 5 by Anonymous from Stunning rings The pictures on the website don’t do them justice. The rings look vintage, different and stunning. The rings were purchased to replace my existing rings which were too big and we couldn’t have made a better choice. Also got them in the sale at half price which make them an even better buy. Rated 5 out of 5 by Anonymous from 9ct white gold 0.5ct diamond bridal set The picture was lovely, but it is stunning in real life! Pure quality! Would definitely recommend!